These colour coordinated drink bottles feature a convenient drinking spout which enables you to drink when the bottle is in a vertical position. The double finger grip makes Lancer a pleasure to carry. 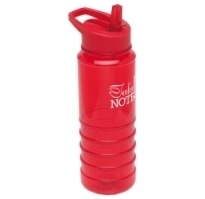 This bottle is made from BPA free materials and is available in translucent blue, red or clear. For use with cold liquids only. Available with optional insulated neoprene pouch (R8210).